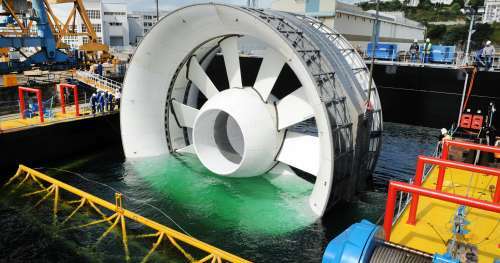 Testing of an Openhydro tidal turbine. The OpenHydro 2MW device generates electric power through the inflow and outflow of water at low and high tides. The turbine has a diameter of 16 metres. The igus E-Chain 4040 from the E4/4 series protects the deployed Chainflex motor and signal cables during the lifting and lowering movements of the turbine and also protects them against aggressive ambient conditions. The travel distance amounts to approx. 20 metres in vertical direction above and under water with the robust E-Chain guided in a steel trough. The robust E-Chain is thereby guided in a stainless steel trough. The vertical travel is transformed into a horizontal stroke by turning through 90 degrees. A plastic chain makes any kind of maintenance on the open sea superfluous and was the only eligible solution because a conventional metal chain would not have stood up to the combination of technical environment and mechanical demands. The island of Alderney is located in the Channel Islands and its territorial waters contain one of the world’s largest tidal energy resources which once fully developed is estimated to power 1.5 million homes. The array developed by OpenHydro and ARE was expected to consist of 150 turbines (2.0MW each) which will produce enough power for over 150,000 homes. Alderney, Channel Islands, UK in water depth around 30m. In December 2005 the States signed an Agreement with a local company Alderney Renewable Energy (ARE) granting it exclusive access to the Territorial Waters for a period of five years to research, survey and test marine devices for the purpose of electricity generation from Alderney's tidal and wave resources. Subject to ARE and its technology partner(s) meeting certain targets and to other conditions precedent, the Agreement provides that ARE will be granted a Master Power Generation License giving it exclusive access to fifty percent of the Blocks for a minimum of fifty years. FAB Link Limited, a joint venture between ARE and Transmission Investment LLP is developing a power interconnector between France, Alderney and Britain. This link will enable the tidal power generated in Alderney’s waters to be exported to European markets, as well as allowing energy to be traded between France and Britain. Development of the FAB project is progressing in conjunction with French Grid operator RTE. The 300MW tidal array was expected to reach full scale deployment from 2020 which would coincide with the commissioning of the FAB interconnector. A press release in 2017 stated that Alderney Commission for Renewable Energy (ACRE), the body responsible for licensing and regulating renewable energy developments in the island’s waters, had decided to end their agreement with Alderney Renewable Energy. Unfortunately in July 2018, project partner OpenHydro’s parent company, Naval Energies, made the decision to liquidate OpenHydro. Tidal developer SIMEC Atlantis Energy expressed interest in potentially filling OpenHydro’s shoes in the French demonstrator project. In October 2018 SIMEC Atlantis Energy announced a joint venture with AD Normandy, Normandie Hydrolienne, which plans to develop a large-scale tidal power project in the Alderney Race, the eight-mile strait that runs between Alderney and France. Construction is planned to commence in 2021. Based in the Channel Islands, Alderney Renewable Energy Ltd. received an exclusive 65 year license from the States of Alderney for the generation of renewable tidal and wave energy from Alderney’s territorial waters. OpenHydro and Alderney Renewable Energy Ltd worked together for nine years to survey Alderney’s waters, prepare environmental studies and plan the development of commercial tidal farms in the waters around Alderney. This cooperation culminated in OpenHydro acquiring a 31% shareholding in Alderney Renewable Energy Ltd. In addition, this agreement placed OpenHydro’s Open-Center Turbines as the preferred technology for the development.Fully developed, the resource would have contained up to 3,000 of its turbines which represents a capital investment in excess of 3 billion in OpenHydro technology. Alderney, its adjacent islands, islets and surrounding coastal waters exhibits a diverse range of marine sublittoral, intertidal and terrestrial habitats. The rocky shores, including rock pools, kelp beds, and sandbars are locally important for fish and shell fish, such as ormers, crabs, lobsters, bass and plaice. Of notable importance are large bird colonies on the island of Burhou and rocky islets, which support large breeding colonies of northern gannet (Morus bassanus), Atlantic puffin (Fratercula arctica), and European storm-petrel (Hydrobates pelagicus). There is also a seal colony to the north of Burhou Island. The conservation significance of Alderney's west coast and the Burhou Islands, has been recognized as an area of international importance. This has led to the designation of a Ramsar site in 2005. The designation places an obligation on the States of Alderney to develop a framework for the conservation of the Ramsar Site. Seabirds are one of the key criteria for the Ramsar designation because of their abundance in nationally and internationally important populations. The designation also acknowledges the importance of shoreline, intertidal and sublittoral habitats and marine flora. These include a number of different habitats. Among global priority habitats, seagrass beds occur at and below low-water mark; there is also a small area of dune slack wet-grasslands at Platte Saline. These form part of a rich complex of habitats, including vegetated shingle banks, sand dunes, dune and coastal grassland, soft cliffs, sandy, gravelly and rocky shores (including the offshore islands of Burhou, Les Etacs and Ortac). ARE has developed a Regional Environmental Assessment (REA) framework which applies to policies, plans and programmes that evaluates environmental impacts and associated risks at a strategic level. ACRE has developed a draft REA which is under formal consultation that will be applied to the Programme that will allow the Environmental Statements (ES), that are required to support each consent application to feed information on specific concerns and effects. The REA assesses the potential cumulative impact of the Programme on the environment in combination with other known developments in the wider area and will consider cumulative impacts. These may include future tidal device schemes within the wider area, in addition to any French developments that might be relevant and have a cumulative impact pathway. This fundamental difference in approach leads to a variety of differences between the application, output and outcomes of both REA and EIA. OpenHydro Alderney is located in United Kingdom. Potential impacts to Alderney seabirds. Literature review/previous studies on Openhydro at different locations. There may be indirect effects on sea birds, if for example, their prey was disturbed due to construction, operations and maintenance. Potential impacts to Alderneys Marine mammals. Potentially marine mammals could collide with the OpenHydro device. Potential impacts to fish stocks. Fish stocks could be effected by electric magnetic fields (EMF). Potential impact to local sediments. Disturbance could occur from vibrations and noise due to drilling. Potential impacts to shipping navigation. Large bottom mounted devices possibly up to 2MW in size could be deployed in the Race in less than 40m depth. Devices of this size occupy up to 20m of water leaving less than 20m clearance above the device. This is potentially too shallow for large commercial vessels therefore a permanent exclusion zone would need to be applied. Tidal energy development could have some impact if a large substation was built on the island. However, if this facility was located in Mannez Quarry it would be largely concealed from the rest of the island. Potential changes to current employment on the island. During construction of a large scale array an estimated 130 personnel could be directly involved in tidal energy development. Therefore creating jobs on the island. Impacts to buildings and infrastructure. Alderney is a small island of only 11 km2. Much of the land area has either protected conservation status or has specific land use designations which permit only limited development. Any new infrastructure on the island would, therefore, be subject to stringent planning requirements which may limit the extent of any land based facilities. AEA. (2008). Strategic Tidal Stream Assessment for Alderney. Report to Alderney Commission for Renewable Energy.